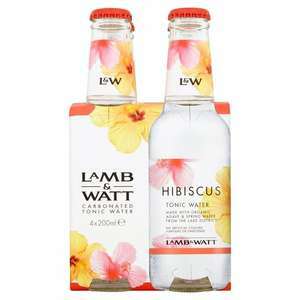 Lamb and Watt Hibiscus Tonic Water with Floral notes and a delicious charge of sweetness. Great for dry and herb infused gins. Serve cold for maximum refreshment. It is free from artificial colour, flavour or preservatives. Available in 200 ml bottle. I’ve not yet tried it, but had planned to buy it at the previous discount price of £9.00 a few days ago. Reviews really good and makes it good value for premium tonic water! Ocado sell this for £3.00 for a pack of 4 so very good price. Awesome had tonic on alert from all the gins I’ve bought. Worth a punt at that price! Heat added. Lovely tonic - even turns Gordons into a really nice Gin.